4 Comments on Happy Birthday to Coca-Cola! Do you know how the company got it’s name? The Cola part comes from the kola nut which has the caffeine. You may want to sit down & have some vapors handy, Coca is ,well there is no easy way to put this, Coca is cocaine. But I believe at the time cocaine was seen as a cure all so it may not have been to big of a deal. Now a days this is something that Coca Cola likes to keep swept under the rug. But I grew up hearing this & every so often the History Channel will have a show about the drug use in America 7 this part abou Coke will be part of he story. I am so craving a bottle of Coca-Cola now! 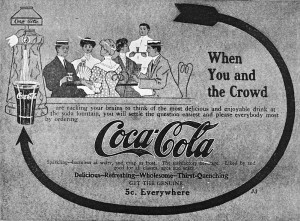 Being from Atlanta and even working in the advertising offices after college in the early 1960s and into the 179s, I can assure you the fact that COCA COLA had a tad of cocaine in it at the beginning was very well known back in the day. When the Government outlawed it, it was promptly removed.